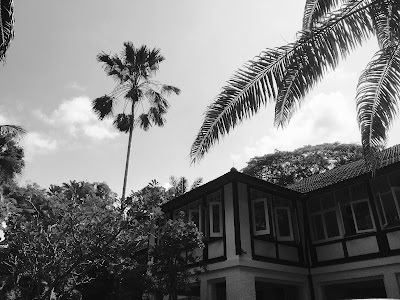 After our last move, we vowed we would never move again, at least, as long as we lived in Singapore. But we would not be real bedouin, nomads, if we had not yet again developed that itch. We lasted three years. Then, the grass turned out greener on the other side of the PIE motorway. Our new house is lovely, but the move wasn’t, still isn’t, an easy one. With these Black & White, government owned, colonial bungalows, you can’t plan. When one came up that we liked, we put in a cheeky bid, got lucky, signed the lease. The house was over a hundred years old, had been empty for 3 years, and needed some work. Well, actually, a lot. The landlord promised to do the work, and we went on holiday in happy anticipation. When we returned from our holiday the grass was still greener, but also an inch higher, and nothing else had chanced. Many angry phone calls later, they started the work, six days before the movers would come. We have been living there two weeks now, and still have contractors over almost daily. The amount of workers involved in the renovation is amazing. We have plumbers, electricians, gardeners, builders, painters, aircon installers. Not always at the same time, but Asian contractors never travel alone – at least four men are needed to fix a faulty light. They are an international bunch, coming from all over Asia; the majority from Bangladesh, but also India, Malaysia, Myanmar, China, and occasionally, Singapore. On Sunday, most of them work on. When I told them the house would still be there on Monday, and that a few more days’ delay did not matter, they looked at me, that white, privileged, naive Ang Moh expat wife, and said that even if they did not work here, their boss had many urgent projects to finish. When the initial clouds of rushed moving stress lifted slightly in my head, I started thinking more about the workers. I did not know where these men stayed, how much they got paid, and whether they were treated fairly. I chatted to them, trying to get to know them, but most gave polite answers, the ones they think you like to hear. Recently, I gave a lecture to students about corporate human rights, where I stated that as a company, you need to make sure your contractors and sub-contractors stick to the same moral values as you do. I did not practice what I preached. I needed to try at least. So I started with one, which we hired ourselves, unlike most of the other contractors that were the landlord’s. He was a nice guy, and when asked he said it was fine for them not to come on Sunday. When I asked if he would give him the day off, he laughed, and said that they were free to do the overtime, or not. He was a good employer. Most chose the money, he said. It was not exactly what his men had told me, but lecturing a local, as a foreigner, is a tricky business, and he still had to finish the work, so I continued about how days off are good for moral, for mental well-being, and so on. He wholeheartedly agreed. But I don’t know where his workers were that Sunday. Challenging a system, if you want to stay polite, and get things done at the same time, is, well, a challenge. I am full of words on paper, but in real life, I am not that brave. I left it after that. Well, we did buy them all pizza.